One specific challenge we took on 4 years ago was to develop opportunities for youth to have a meaningful outlet for their STEAM skills development as a result of their time spent in our workshops and maker spaces. We wanted to connect young people overseas with this common interest in STEAM and give kids the chance to show how global and inter-connected technology and 21st century learning is. There are numerous opportunities to collaborate and compete in robotics, but these mainly exist well outside of Uganda. Financially and logistically, it is not feasible for most students involved in robotics and coding to experience the chance to share, collaborate and compete with their projects at events and competitions. We think this is an important outlet for kids – to feel apart of something bigger and to see that kids EVERYWHERE are excited by the same things, capable of the same things and are on similar pathways in STEAM. This led us to develop STEAM showcase events and competitions of our own with the focused goal of bringing international competition to students, without them having to leave their respective home schools/regions. In this way we can create exciting, innovative and unique STEAM educational opportunities for both Canadian students and students with no means to take part in these types of events in rural Africa. Through our programs, students collaborate on a common STEAM project (designing, building and programming robots to compete in various challenges) with distance posing no barrier (through online teleconferencing, live feeds and live data collection/scoring). Technology is used not only for building the competition "equipment" for the event (robots/computer code/the arenas), it is also the vehicle to conduct the workshop, document the activities and collect and record data. We developed a set of events for each of these competitions and issued the rules and challenges to students in Uganda and overseas (Columbia and Canada) at the same time. The event date was set and the students had to build the same challenge set ups and competition fields. They then had to build and code their own unique robot to compete in each event. These were sport themed and included events like shot put, the 10m dash and gymnastics. The students took turns watching and competing via Google Hangouts and the standings were updated live on a Google Sheet. An official medal award ceremony took place with a lot of design and code comparison taking place between the groups. A cross-continental Rube Goldberg Machine that started in Canada and ended in Uganda. It started with a Ugandan student group sending a tweet which lit up the face of the Canadian student group’s IPAD. This then triggered a light sensor on their robot. This robot started a chain reaction which ended with a pencil pressing “send” which placed a call to the Ugandan student group’s phone, resulting in the phone vibrating and falling into a cup attached to a pully. The resulting chain of action culminated with the Ugandan student group’s robot driving forward to pop a balloon filled with candy! The students on both ends watched one another’s machines via Google Hangouts. It was complex; it was creative; it was collaborative… and it was FUN! This experience is just one example of the types of workshops and events we host which give kids the chance to meet and appreciate one another, see how distance is not a barrier to co-operate and work together and to see how STEAM skills present universal learning opportunities that can overcome challenges and solve problems, regardless where you live in the world. Students created animal themed robots, with animal-like traits in movement or structure. They demonstrated them via a live connection from the Hackerspace in Jinja to students doing the same task at libraries in Ontario, Canada. This event allowed kids to have the chance to talk to others with a common interest and not only share their ideas, but have a chance to make some new connections across the globe in a way that was purposeful and meaningful. The sameness of the event really drove home the point that kids are kids, no matter where they are! This entirely student designed, and developed project is ongoing. This collaborative creation, ARINA (Active Robotics Interaction Networking App) is entirely student developed, prototyped and tested through students in Canada and in Uganda. As far as we know, this event was also a first of its kind. Using the robotics and computer equipment at the Hackerspace, our Ugandan students created an app, a server, and built some simple test mechanisms with the NXT kits. They had the Canadian students build test mechanisms as well and downloaded the Android app. 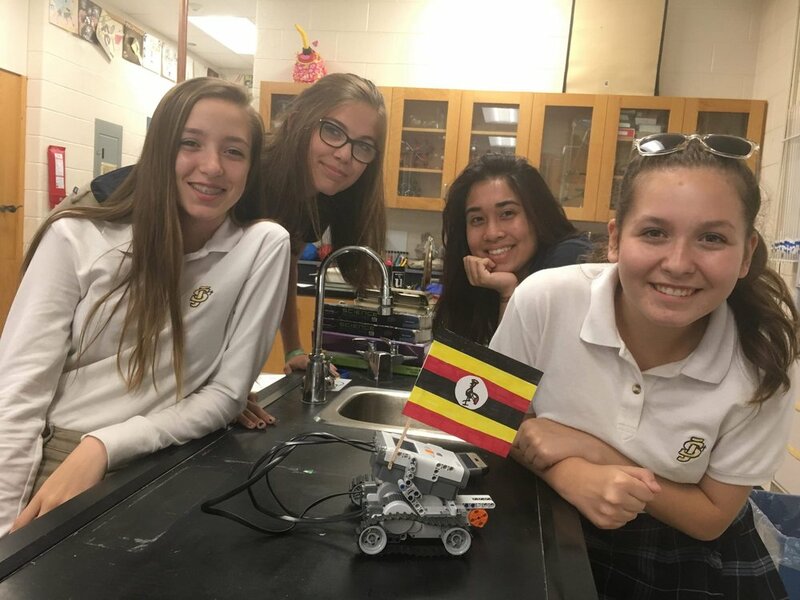 With these in place on both continents, the students managed to control the Ugandan mechanism from Canada and the Canadian mechanism from Uganda! It was nothing short of a remarkable feat for self-taught learners! The thrill of the first moment of connection is one that none of us will forget. It was a moment of shared experience, and the power of technology to unite people was never more evident to everyone involved than at that moment. The future goal for ARINA is to host and develop an international competition in an arena where 2 sets of replicated robots can compete live at the same time at the same task in two places at once. Read all the details here in our blog post! This annual competition is an opportunity for our 3 Ugandan Robotics teams to get together in person and compete. Part of the event involves competing with students remotely overseas as in the other tournaments, but the rest takes place in person with the Ugandan teams competing on site at our tournament venue. We wanted to make sure this experience was both authentic in the learning that goes on but also equal in the equipment used as the tournaments overseas. Our teams unfortunately do not have the means to compete overseas, in part because JCEO just doesn’t have that kind of funding, but the students absolutely have the talent, ability and passion to be part of this global movement to compete in robotics. We feel strongly that developing a tournament experience matters! Using past VEX EDR games like Nothing but Net, we adapted the original game to be more suited to 1v1 play. The tournament involves all of the same experiences that the big scale robotics events offer overseas, such as design judging, performance assessment, presentations to a judging panel, live announcing and music, a live stream, and of course the referred robot game itself. It is a full day event and includes a celebration lunch and an award ceremony. All of the volunteer staff (refs, judges, timers, videographers) for this event are Ugandan University students who are experienced or majoring in technology related fields. Each year we hope to expand and improve this tournament to create an even better experience of meaningful, competitive STEAM opportunities to Ugandan youth.